A chief ingredient of a fiery sauce that is traditional used as an accompaniment to roast beef or grated into coleslaw, horseradish is a vigorous, hardy perennial that forms a mass of leafy growth, but is primarily raised for its pungent roots. Plants can become invasive and difficult to eradicate when grown in the ground – best kept under control by growing in pots or raised beds filled with rich, well-drained soil. Looking after horseradish is a doddle. Keep plants well watered during the growing season, especially during periods of drought to prevent the foliage from slumping. Give plants in pots a boost in summer by applying a balanced liquid fertiliser. Very little work with secateurs is necessary. Simply snip off any damaged leaves to prevent the crop from become too unsightly, and remove dead growth from around the crown of the plants in autumn. Unlike so many other edibles, this is a tough, easy to look after herb that is rarely troubled by any pests or diseases. Plants can be grown by seed, but it is far easier to raise from pieces of root, known as thongs, which are available from specialist growers in spring or from pot-grown plants that can be bought all year round. To grow in pots, fill with multi-purpose compost including peat free media, make some deep vertical holes with dibber, then drop in a thong so that the top is 5cm (2in) beneath the surface of the compost and cover. Three thongs in a 30cm (12in) container is ideal. Place in a sunny or partially shaded spot. Growth will soon appear from above the surface of the compost or soil in spring. It is also easy to grow in garden soil but can become a weed unless carefully managed. 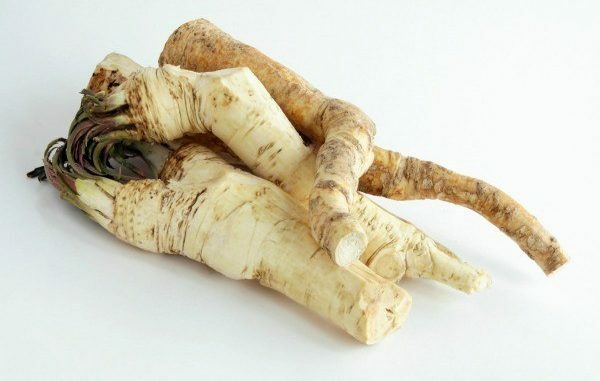 Horseradish can be harvested after the foliage dies back in autumn and the flavour of the roots is much better if plants have been subjected to frost. As this is a very vigorous plant that will quickly outgrow its allotted space in a pot, harvesting some of the roots allows you to curtail its spread. Harvesting is simple. Upturn the pot and remove about half of the slender white roots, then replant the remaining portion in fresh compost. These will burst back into life in spring as a flush of new leaves appears from beneath the surface of the soil. In raised beds, simply lift what you need with a garden fork. Horseradish roots are best used fresh, but if you have a glut you can wash, grate and dry the roots. Alternatively, store roots until ready to use by bundling them together and placing them in a wooden box or tray covered with damp sand. Put the box in a cool, dark and frost free place.